2 The gates of Zion Jehovah loves More than all the dwellings of Jacob. 4 I will proclaim Rahab and Babylon as those who know Me: "Behold Philistia and Tyre, with Cush; This one was born there." 5 And of Zion it shall be said, "Man after man was born in her," And He, the Most High, shall establish her. 6 Jehovah shall reckon when He writes down the peoples, "This one was born there." Selah. 7 And singers and dancers [shall chant], "All my fountains are in Thee." One clear note sounds in this remarkable psalm. Its single theme is the incorporation of ancestral foes and distant nations with the people of God. Aliens are to be enrolled as home-born citizens of Jerusalem. In modern words, the vision of a universal Church, a brotherhood of humanity, shines radiant before the seer. Other psalmists and prophets have like insight into the future expansion of the nation, but this psalm stands alone in the emphasis which it places upon the idea of birth into the rights of citizenship. This singer has had granted to him a glimpse of two great truths--the universality of the Church, and the mode of entrance into it by reception of a new life. To what age of Israel he belonged is uncertain. The mention of Babylon as among the enemies who have become fellow-citizens favours the supposition of a post-exilic date, which is also supported by resemblances to Isa. xl.-lxvi. The structure is simple. The psalm is divided by Selah into two strophes, to which a closing verse is appended. The first strophe bursts abruptly into rapturous praise of Zion, the beloved of God. The second predicts the gathering of all nations into her citizenship, and the closing verse apparently paints the exuberant joy of the festal crowds, who shall then throng her streets. The gates of Zion before all the dwellings of Jacob. But this is not necessary; for the verb may as well be supplied to the first as to the second clause. The harshness of saying "His foundation," without designating the person to whom the pronoun refers, which is extreme if ver. 1 is taken as a separate sentence, is diminished when it is regarded as connected with ver. 2, in which the mention of Jehovah leaves no doubt as to whose the "foundation" is. The psalmist's fervent love for Jerusalem is something more than national pride. It is the apotheosis of that emotion, clarified and hallowed into religion. Zion is founded by God Himself. The mountains on which it stands are made holy by the Divine dwelling. On their heads shines a glory before which the light that lies on the rock crowned by the Parthenon or on the seven hills of Rome pales. Not only the Temple mountain is meant, but the city is the psalmist's theme. The hills, on which it stands, are emblems of the firmness of its foundation in the Divine purpose, on which it reposes. It is beloved of God, and that, as the form of the word "loves" shows, with an abiding affection. The "glorious things" which are spoken of Zion may be either the immediately following Divine oracle, or, more probably, prophetic utterances such as many of those in Isaiah, which predict its future glory. The Divine utterance which follows expresses the substance of these. 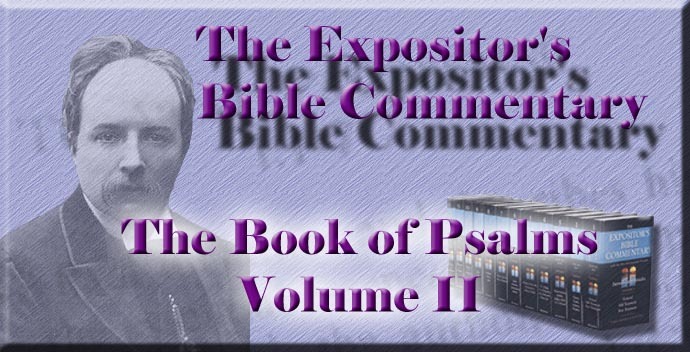 So far, the psalm is not unlike other outpourings in praise of Zion, such as Psalm xlviii. But, in the second strophe, to which the first is introductory, the singer strikes a note all his own. There can be no doubt as to who is the speaker in ver. 4. The abrupt introduction of a Divine Oracle accords with a not infrequent usage in the Psalter, which adds much to the solemnity of the words. If we regard the "glorious things" mentioned in ver. 3 as being the utterances of earlier prophets, the psalmist has had his ears purged to hear God's voice, by meditation on and sympathy with these. The faithful use of what God has said prepares for hearing further disclosures of His lips. The enumeration of nations in ver. 4 carries a great lesson. First comes the ancient enemy, Egypt, designated by the old name of contempt (Rahab, i.e. pride), but from which the contempt has faded; then follows Babylon, the more recent inflicter of many miseries, once so detested, but towards whom animosity has died down. These two, as the chief oppressors, between whom, like a piece of metal between hammer and anvil, Israel's territory lay, are named first, with the astonishing declaration that God will proclaim them as among those who know Him. That knowledge, of course, is not merely intellectual, but the deeper knowledge of personal acquaintance or friendship--a knowledge of which love is an element, and which is vital and transforming. Philistia is the old neighbour and foe, which from the beginning had hung on the skirts of Israel, and been ever ready to utilise her disasters and add to them. Tyre is the type of godless luxury and inflated material prosperity, and, though often in friendly alliance with Israel, as being exposed to the same foes which harassed her, she was as far from knowing God as the other nations were. Cush, or Ethiopia, seems mentioned as a type of distant peoples, rather than because of its hostility to Israel. God points to these nations--some of them near, some remote, some powerful and some feeble, some hereditarily hostile and some more or less amicable with Israel--and gives forth the declaration concerning them, "This one was born there." God's voice ceases, and in ver. 5 the psalmist takes up the wonderful promise which he has just heard. He slightly shifts his point of view: for while the nations that were to be gathered into Zion were the foremost figures in the Divine utterance, the Zion into which they are gathered is foremost in the psalmist's, in ver. 5. Its glory, when thus enriched by a multitude of new citizens, bulks in his eyes more largely than their blessedness. Another shade of difference between the two verses is that, in the former, the ingathering of the peoples is set forth as collective or national incorporation, and, in me latter,--as the expression "man after (or by) man" suggests,--individual accession is more clearly foretold. The establishment of Zion, which the psalmist prophesies, is the result of her reinforcement by these new citizens. The grand figure of ver. 6 pictures God as taking a census of the whole world; for it is "the peoples" whom He numbers. As he writes down each name, He says concerning it, "This one was born there." That list of citizens is "the Book of the Living." So "the end of all history is that Zion becomes the metropolis of all people" (Delitzsch). Three great truths had dawned on this psalmist, though their full light was reserved for the Christian era. He had been led to apprehend that the Jewish Church would expand into a world-wide community. If one thinks of the gulfs of hatred and incompatibility which parted the peoples in his day, his clear utterance of that great truth, the apprehension of which so far transcended his time, and the realisation of which so far transcends ours, will surely be seen to be due to a Divine breath. The broadest New Testament expression of Universalism does not surpass the psalmist's confident certainty, "There is neither Greek nor Jew, barbarian, Scythian," says no more than he said. More remarkable still is his conception of the method by which the nations should be gathered in to Zion. They are to be "born there." Surely there shines before the speaker some glimmering ray of the truth that incorporation with the people of God is effected by the communication of a new life, a transformation of the natural, which will set men in new affinities, and make them all brethren, because all participant of the same wondrous birth. It would be anachronism to read into the psalm the clear Christian truth "Ye must be born again," but it would be as false a weakening of its words to refuse to see in them the germ of that truth. The third discovery which the psalmist has made, or rather the third revelation which he has received, is that of the individual accession of the members of the outlying nations. The Divine voice, in ver. 4, seems to speak of birth into citizenship as national; but the psalmist, in ver. 6, represents Jehovah as writing the names of individuals in the burgess-roll, and of saying in regard to each, as He writes, "This one was born there." In like manner, in ver. 5, the form of expression is "Man after man," which brings out the same thought, with the addition that there is an unbroken series of new citizens. It is by accession of single souls that the population of Zion is increased. God's register resolves the community into its component units. Men are born one by one, and one by one they enter the true kingdom. In the ancient world the community was more than the individual. But in Christ the individual acquires new worth, while the bands of social order are not thereby weakened, but made more stringent and sacred. The city, whose inhabitants have one by one been won by its King, and have been knit to Him in the sacred depths of personal being, is more closely "compact together" than the mechanical aggregations which call themselves civil societies. The unity of Christ's kingdom does not destroy national characteristics any more than it interferes with individual idiosyncrasies. The more each constituent member is himself, the more will he be joined to others, and contribute his special mite to the general wealth and well-being. Ver. 7 is, on any interpretation, extremely obscure, because so abrupt and condensed. But probably the translation adopted above, though by no means free from difficulty or doubt, brings out the meaning which is most in accordance with the preceding. It may be supposed to flash vividly before the reader's imagination the picture of a triumphal procession of rejoicing citizens, singers as well as dancers, who chant, as they advance, a joyous chorus in praise of the city, in which they have found all fountains of joy and satisfaction welling up for their refreshment and delight.